Roll-up your glass! How warm and hot glass can live in harmony. 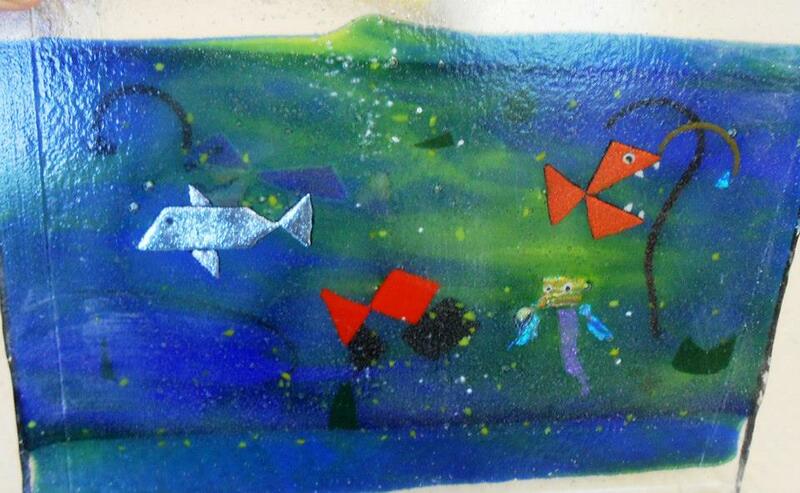 Some pix of the great work made by the roll-up class – where the students made a fused glass panel here at the Washington Glass School, and the following week, the class was held at DC Glass Works, where the fused panel gets…. well… rolled-up and blown into vessel shapes. 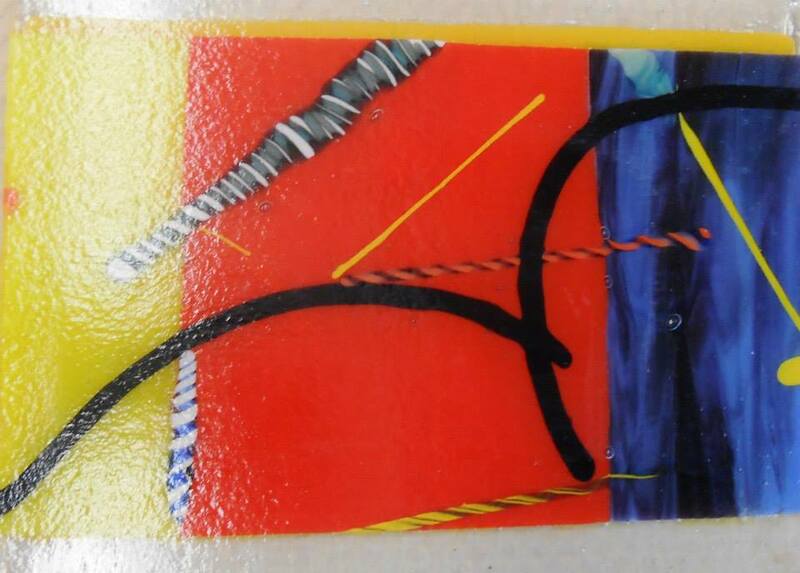 This process gets all the benefits of fused glass— creating differing inside and outside imagery, precise color placement, and full cross-sections of color. The flat fused panels get rolled up and blown. Audrey and Dave working in the DC Glassworks hotshop. …now ready to hold sharks and mermaids! The blown work getting ready for the anneal cycle at the hot shop. A great class and a great time! As part of the 50th Anniversary celebrations in honor of the 1962 Toledo Glass Workshop, the Washington Glass School blog is looking the heritage of the art movement. 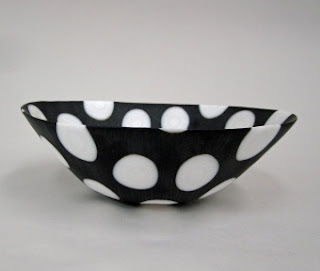 This is the second part in an historical overview of how fused glass (aka kiln-formed, or warm glass) fits into the contemporary Studio Art Glass Movement. 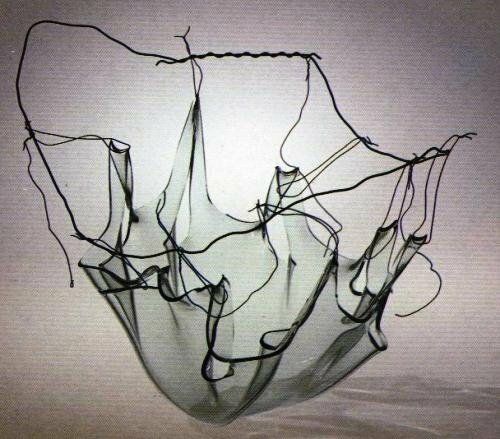 Much of the information was based on published writings by Martha Drexler Lynn, William Warmus & Beth Hylen, Richard LaLonde, Dan Schwoerer & Boyce Lundstrom and from the Corning Museum of Glass library. The 1962 Toledo glass workshops indeed marked a watershed. After the workshops, glass moved into university and college programs and significantly into fine arts programs. 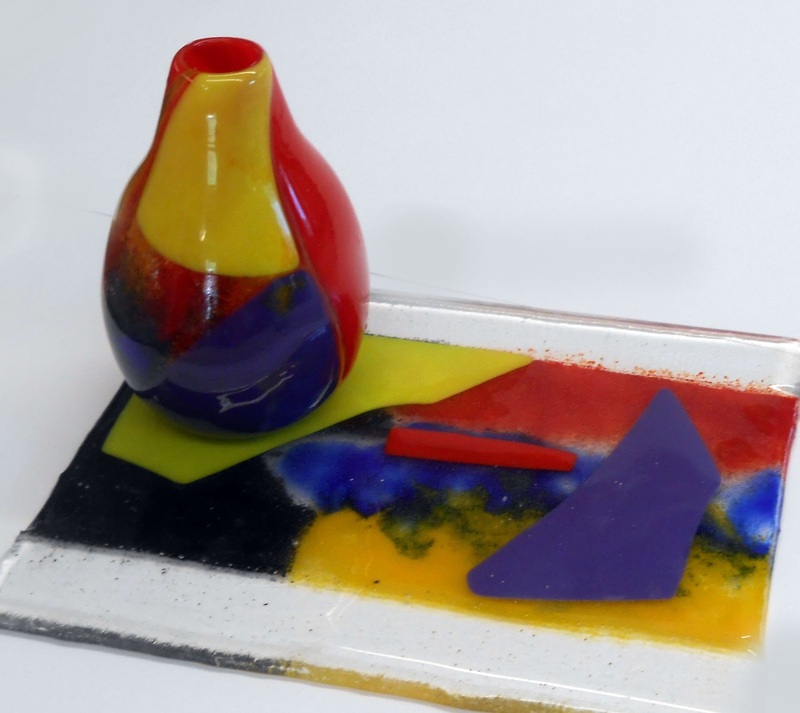 After the two workshops, by 1964, (hot) glass artists were increasingly college educated in fine arts degree programs that required the same course work demanded for painting or sculpture. In the early days of the Studio Glass Movement the compelling attitude was the quest to spread the word and distance glass art from both the factory and hobbyist. Hot glass had reconstituted itself with the museum’s blessing, and had achieved a new identity. Other aspects also had an influence on the growing art movement. The young artists were entranced by notions of an alternative lifestyle free of the establishment values of the older generation. “We were hippies, Okay? People have to understand that. 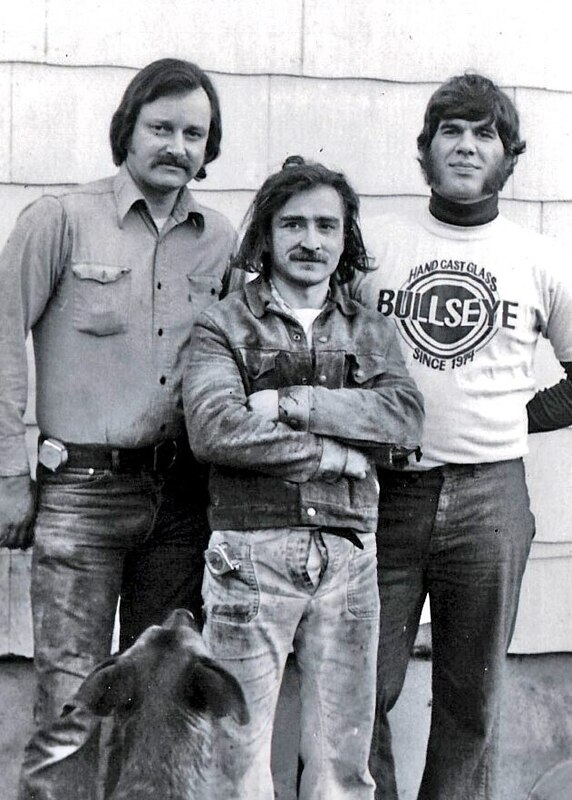 No watches, no underwear, no nothing” remembers Toots Zynsky regarding the early days at Pilchuck. 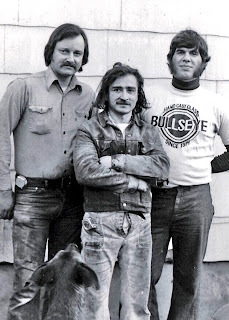 Learning to make art with glass, rejecting bourgeois rules, and living an anti-establishment lifestyle were irresistible and became part of the lore both of Pilchuck and of the glass movement in general. Antique collecting in the 1960’s brought about a renewed interest in stained glass. Cities such as Denver, CO became trading centers for stained glass windows removed from old East Coast houses and buildings. The demand for turn-of-the-century stained glass encouraged studios to create works ranging from Tiffany style reproductions to contemporary designs. The rapid growth of the new stained glass studios across the country, brought about by the demand for stained glass, was made possible by new types of glass manufacturers and the influence of the growing Studio Glass movement and Harvey Littleton. “Our experience in the glass world pointed to a need for more colored sheet glass for the stained glass industry…(I) began working with glass in 1965, when I joined the new glass program established by Dr. Robert Fritz that year at San Jose State University in San Jose, California. At that time I was a ceramics major, studying with one of the great ceramic glaze technicians of our time, Dr. Herbert Sanders. The close correlation between the calculating and making of ceramic glazes and the process of making glass is a natural one. So, as a potter studying glaze calculation, I found it natural to apply the technology to glass, and was soon drawn by the material. Said Boyce: “For the next four years, the pressing demands of an infant company consumed all of my time. 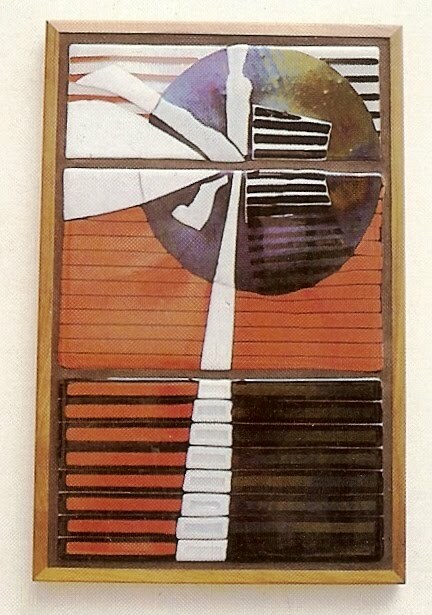 In 1978 I began designing independent stained glass panels, executed for me by more capable craftspersons. Since, at Bullseye, we produced mixed colors of glass daily, and had control of the formulas, it seemed a foregone conclusion that we could make sheet glass with similar coefficients of expansion. The thought process went something like this: if sheet glasses had the same coefficient of expansion, they could be cut into shapes and fused together. So, I started experimenting in 1979 or 1980–I don’t know exactly when because the process was slow at first, fraught with many failures and just a few successes. If there was one memorable breakthrough, it was the application of the method of testing for stress with a polarimeter (from glass blowing) to glasses fused to a clear sheet glass with a constant coefficient of expansion. When making sheet glass it is not important to have a constant coefficient of expansion among all the glasses. Single colors can all be different and mixed colors only have to be within one or two coefficient points of one another. In glass blowing it is not uncommon to use glasses together that vary in coefficient of expansion by four or five points, because the casing process holds the glass together. But when fusing glass flat, the glasses must be very close in coefficients. Establishing a clear glass as a constant, and then formulating the melt for all colors to fit that constant, made the contemporary glass fusing movement possible. The influence by the hot glass education and artwork by the artists that came from the universities now teaching glass artwork outlined the directions that warm or kiln-formed glass would take. In the late 1960s there was the emphasis on technology and education. 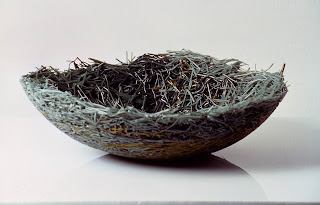 The glass artwork was part of broader international craft movement of the 1960s in which clay, fiber, wood, and metal are used for creative expression. 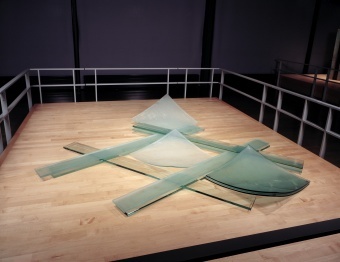 In 1969, glass was rarely seen in contemporary art, especially in large-scale sculpture. However, the American Studio Glass Movement was gathering national momentum. Many studio glass artists looked at contemporary sculpture, such as Gyes Arcade, for inspiration on how glass might be treated artistically. 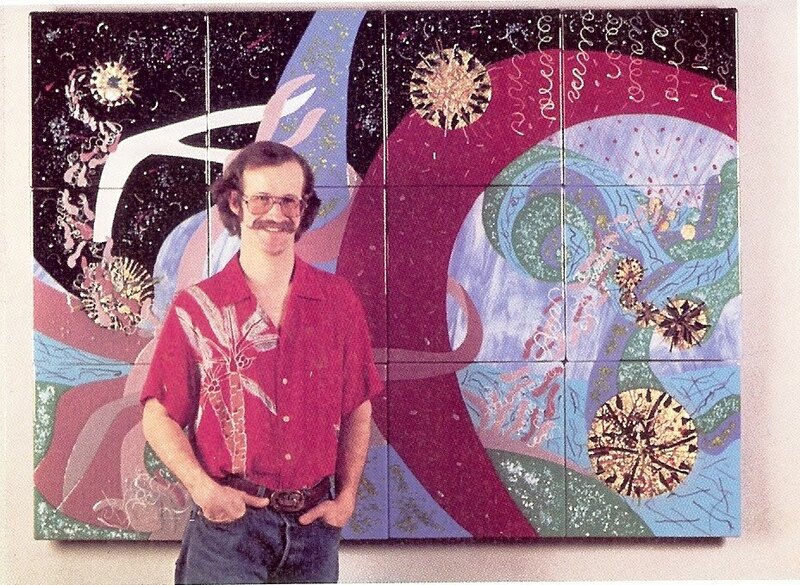 At the 1972 National Sculpture Conference in Lawrence, Kansas, Harvey Littleton introduces his phrase “Technique is cheap” that continues to influence artists. The dichotomy between the sculptor in search of form (the “technique is cheap” attitude) vs. the craftsman striving to create a perfectly executed functional object is a strong motivation for many artists. The explosion of glass schools and studios in the 1970s and 1980s paves the way for a new industry of glass tools, equipment and glass suppliers. Glass kilns originally were ceramic kilns with cones that required watching the stage and temperature of the progress. 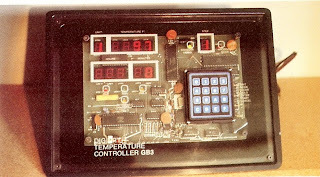 With the programmable computer controls, the fused glass industry was revolutionized. In the early 1980s Spectrum Glass introduced System 96, and Bullseye Glass introduces its “Tested Compatible” glass designed specifically for fusing. 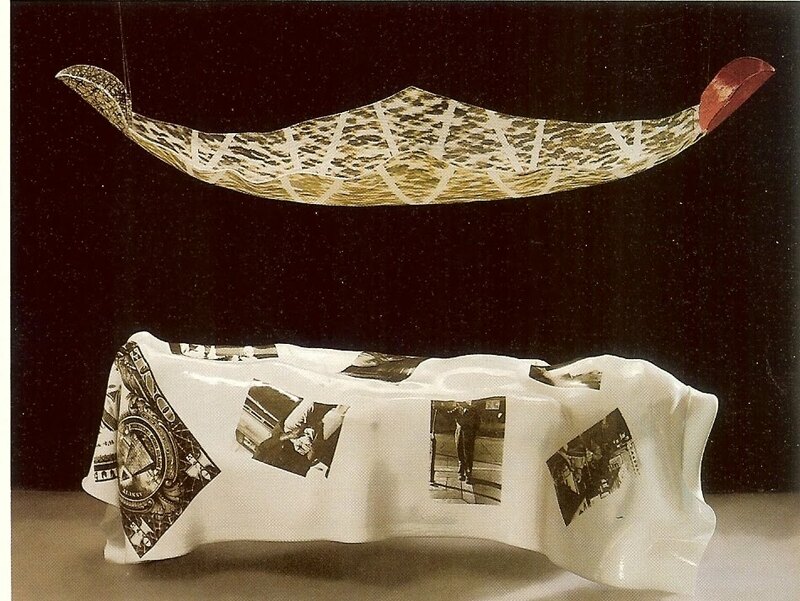 The work by glass artists pursue narrative, political, gender issues and create more multimedia work, combining glass with other materials (wood, metal, paint, stone). 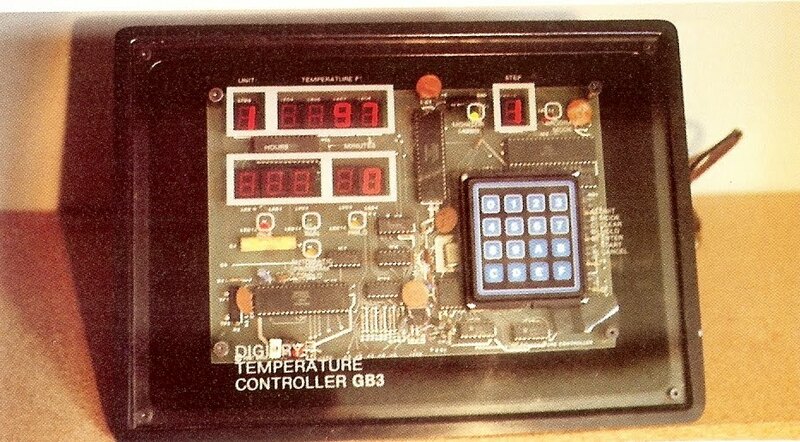 The “Art vs. craft” debate pushes aside technical issues. 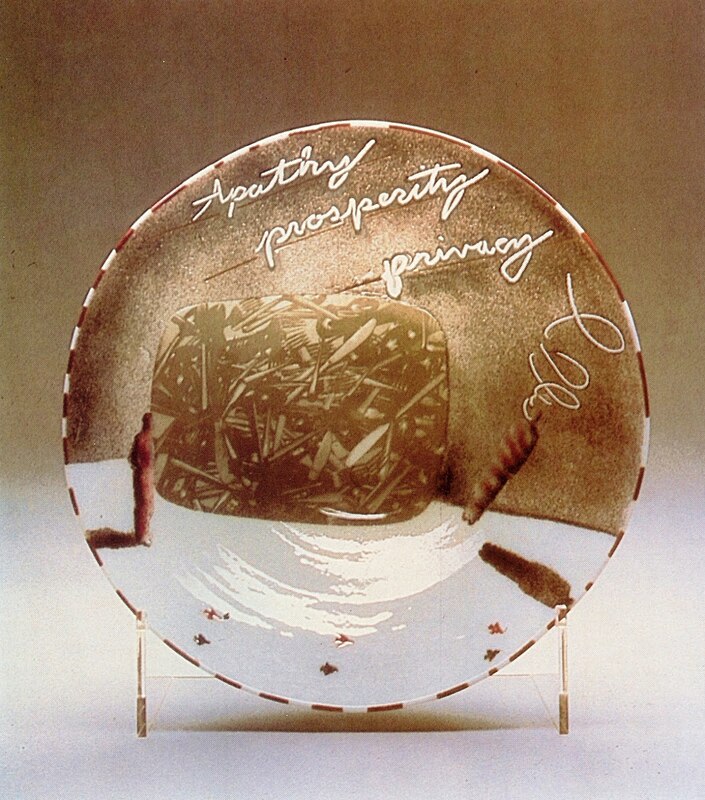 By the mid-1980′s there was an explosion in alternatives to hot glass: pâte de verre, lampworking, kilnworking, coldworking, even microwaved glass jewelry, and women play an increasingly prominent role in the glass movement. With the increase in interest and new glass specific art galleries emerging, art museums begin to exhibit glass in contemporary art sections – and the interest in glass art helps glass magazines flourish. 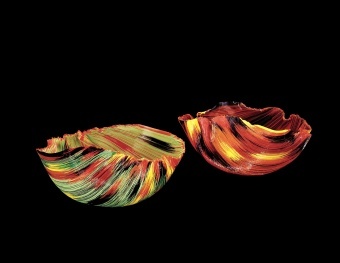 In the summer of 1971, Dale Chihuly brought a small group of his friends and a few RISD students, including Toots Zynsky, to Washington State. 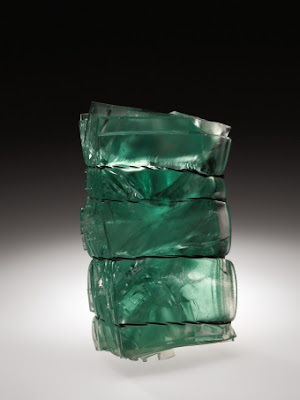 There, she participated in the founding and early development of Pilchuck Glass School. By early 1972, she was making installations with slumped plate glass. In 1973, she began experimenting with video and performance works that incorporated hot and cold glass with artist Buster Simpson. Her experimental work—which was characteristic of much of the art being made in the 1970s—was important for the development of glass as a material to explore issues in contemporary art. Throughout the 1980′s art glass collectors sought to build collections based less on investment value and more on the inherent worth of the artworks and auctions of contemporary glass begin at Sotheby’s and Christie’s. The camaraderie of collectors and friendly competition for the glass artworks lead to a relatively stable market and the development of a glass community. In 1985, Glass Weekend begins at Wheaton Village, Millville, NJ. The biennial seminar brings together leading contemporary glass artists, collectors, galleries, and museum curators. 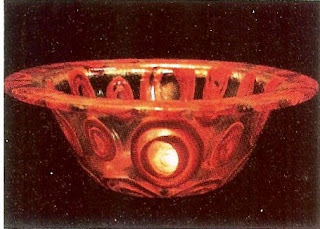 As it became more acceptable for artists to use of glass as a fine-art medium, there began a more expansive use of glass as a component – there was more multimedia work, where glass was combed with other materials (wood, metal, paint, stone), and a perceived reaction against the “beauty” of glass. 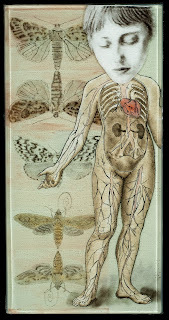 Artists continued to pursue narrative, political, gender issues as expressed in the glass. In 1989 the late Dan Klein, former director of Christie’s auction house and studio glass collector noted that hot glass, which had “enjoyed what seems in retrospect a disproportionate degree of popularity during the 1960’s lost ground to other techniques, until it was felt during the 1980’s that it had been almost completely phased out”. An interesting note to end this segment of the history of fused glass within the context of the American Studio Glass Movement. 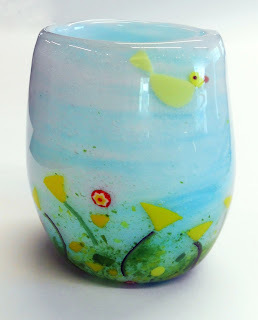 Click HERE to jump to Part 1 of the Washington Glass School blog about the History of Fused Glass. Bullseye Gallery in Portland, Oregon has a great new show of work by artists that use glass as a canvas. “Facture” has already created a bit of a buzz. 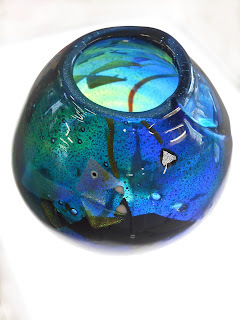 The GLASS Quarterly‘s Ruth Reader has a great article and interview with Michael Janis about using glass as a painter’s canvas. This weekend, January 8, from 2 – 4 pm, Bullseye will host a panel discussion with artists Michael Janis, Kari Minnick, Martha Pfanschmidt, Ted Sawyer, Abi Spring, and Jeff Wallin; moderated by Michael End. 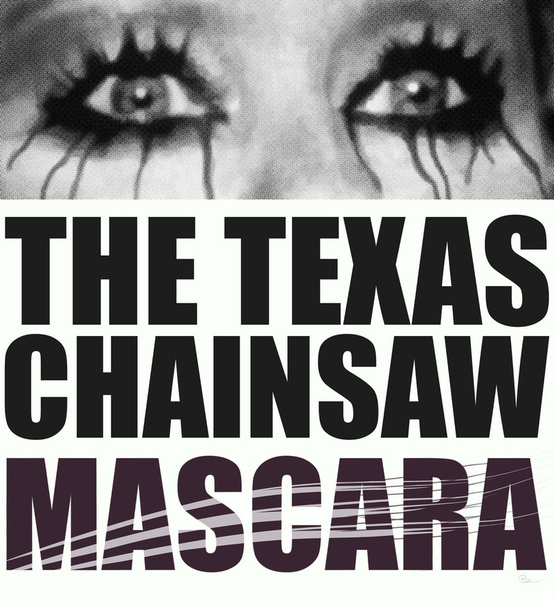 The artists will also present images and discuss their methods. Click HERE to jump to Bullseye Gallery website images of works in the show. What can the “makers” in the field of kiln-glass learn from artists working in other media? What lies at the interface of kiln-glass and forms of expression like painting, architecture, photography, digital technologies, printmaking and textiles? Exploring such questions is precisely the goal of the Bullseye Conference, 2011. Every two years, aspiring and accomplished kiln-glass professionals from around the globe enjoy the opportunity to gather, network, compare notes and expand their horizons. That opportunity is known as BECon (the Bullseye Conference). Portland, Oregon, USA—on the metropolitan campus of Portland State University, which is central to the city’s vibrant, arts-rich core. About 250 artists, designers, fabricators, instructors, and students from around the globe. Are in the planning stages. Update – click HERE to jump to BE workshops. Bullseye is offering 25 scholarships for students. Recipients can attend the conference for $250, less than half the standard price. To qualify, you must currently be enrolled full time in an accredited university or have graduated from an accredited university no earlier than May 2010. 5) a list identifying each work shown in the .jpg files by title of image, title of work, year, technique/media, dimensions, and photographer. Scholarship recipients will be notified by email no later than February 27, 2011. Once notified, recipients will be able to register for the conference at the reduced rate of $250. Will open early in 2011. Contact conference@bullseyeglass.com for more information. Click here and here to learn about Portland, Oregon. >Some great classes are coming up – old and new favorites! Up first is the Bullseye Roll-up. In this class you get to fuse and blow glass! 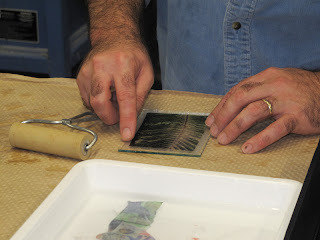 This process allows the detail and care that you can get in a fused piece can be transferred to the hotshop and blown into a dimensional piece. 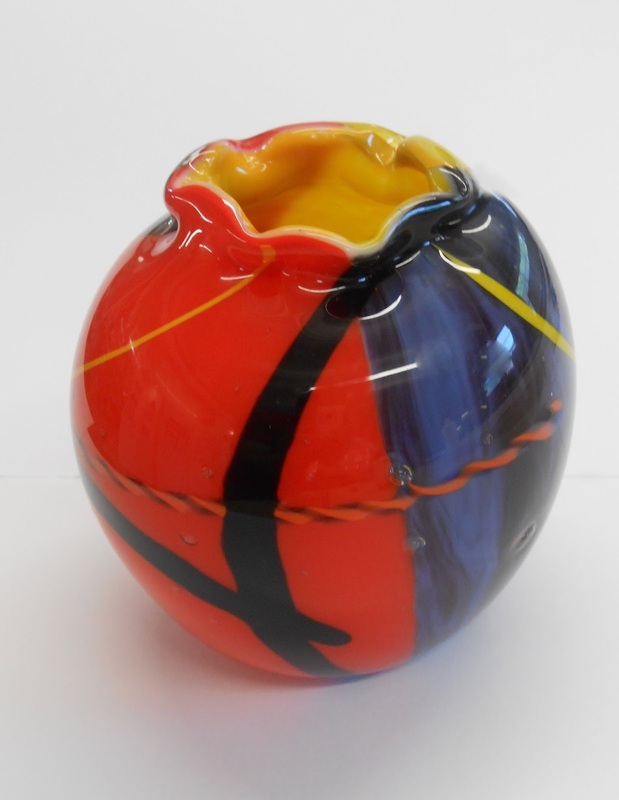 If you are a fuser – a great introduction to the world of blown glass. If you are a blower – imaging the detail you can get! 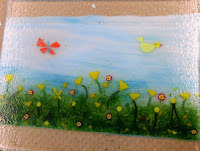 Nancy Donnelly’s Green Eggs & Ham fused glass panel. Blowing at DC Glassworks studio. 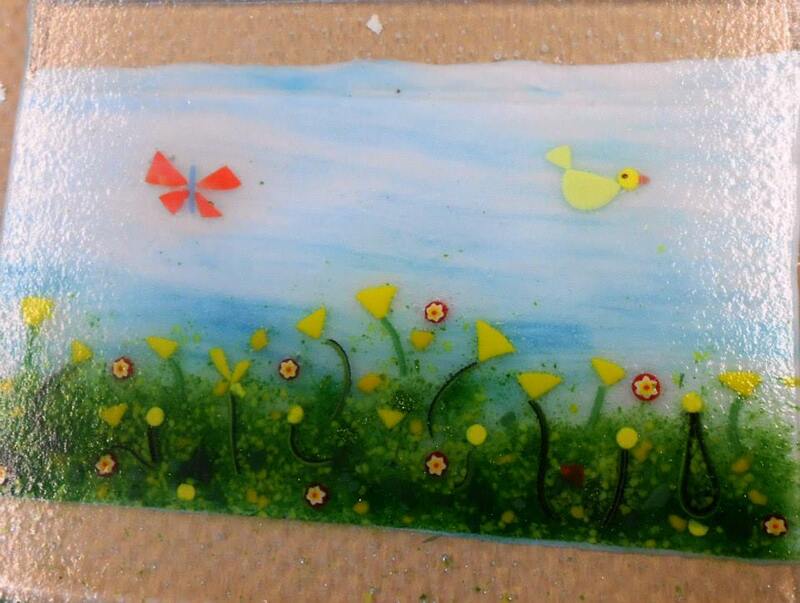 If you’ve ever been interested in making your fused glass panels into blown vessels- then this is the class for you! Come experience one of the most exciting trends in glass – where you get the best of both worlds. One class will be spent fusing Bullseye Glass into a panel at the Washington Glass School. 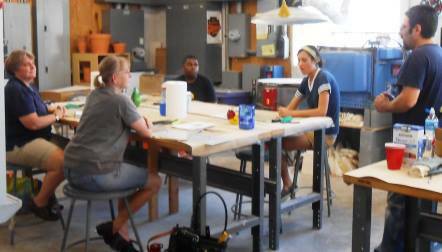 The next class will be held at DC GlassWorks where you will help blow the glass into a vase, or bowl, or even go more sculptural! 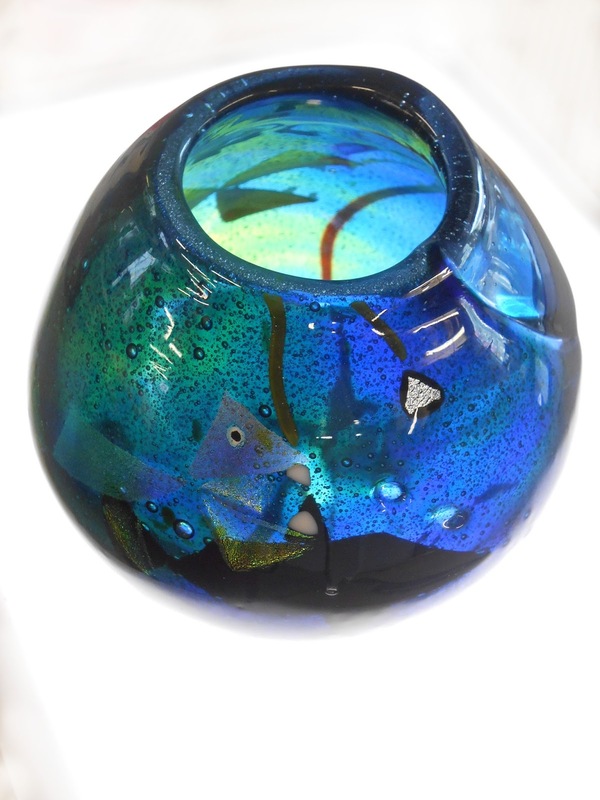 This class is for all experience levels, both fusers and blowers who want to see their imagery in blown glass. 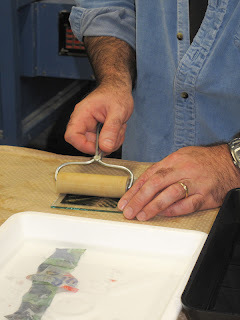 Also coming up everyone’s favorite way to work with photos – emulsion transfer! This fun class gets the photographer in you working! Your photo images (taken during class or from your slides) are transferred via polaroid-style film to glass, paper, whatever. 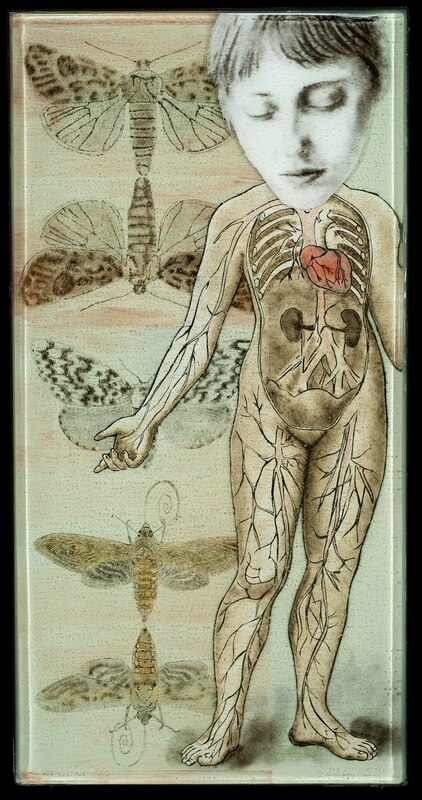 A great way to get imagery in your art! The photo-emulsion transfer process did not die with Polaroid. Learn how to make your images, manipulate them and put them onto almost any surface using Fuji‘s instant print film. Instructors Alison and Pete Duval will show you several tips and tecniques so you can get the most from your images. 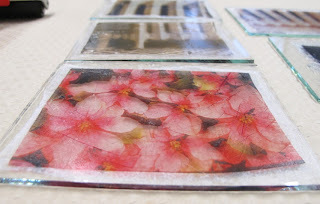 This will be a hands-on workshop, so com prepared to get your hands dirty All materials will be supplied by the instructors – but students are encouraged to bring their own slides and any materials they would like to transfer images to. There is a $20 lab fee for supplies to be paid to the instructors on the day of the workshop. In this weekend class you will tackle the basics of making rubber molds. These molds can be used for the production of parts that can be dupicated in wax – the first step in the Lost Wax Process for casting glass, bronze or aluminum. (Hint: Debra’s amazing Lost Wax Casting class will be offered next semester – plan ahead!) Students will bring in their own pieces to review and explore mold production, undercuts, multipart mold-making, and casting of wax. Students will learn about a variety of materials and which to use in different situations. Students will be asked to bring a minimum of 3 small objects (not more than 1.5″ in any direction).